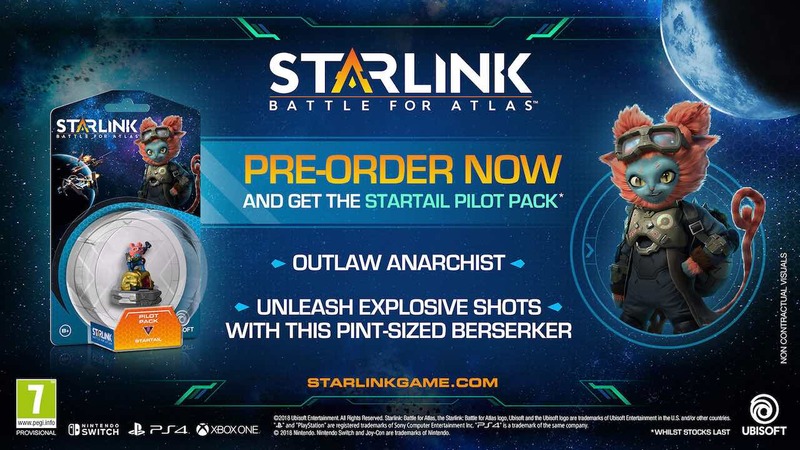 Those that pre-order the Starlink: Battle For Atlas Starter Pack at GAME will receive the Startail Pilot Pack as a bonus that’s exclusive to the specialist retailer in the United Kingdom. The cat-like outlaw anarchist is a pint-sized berserker that can unleash explosive shots and joins the several other interstellar pilots that you can buy for Ubisoft’s galactic take on the toys-to-life genre. Those pilots include Eli Arborwood, Kharl Zeon, Levi McCray, Razor Lemay, Lance, Nadir, Neptune and Pulse. Plus, as we all know now, Fox McCloud will appear as a special guest pilot exclusive to the Nintendo Switch version.